Birmingham City University is committed to sustainability, improving our environmental performance while encouraging and embedding a sustainable way of life for students and staff. As an educational establishment, we have a responsibility not only to educate our students and staff on more sustainable practices, but also to lead by example by improving our own performance. At Birmingham City University, we have an Environmental Management System (EMS) certified to the internationally acclaimed ISO 14001, to monitor and manage our environmental impact. 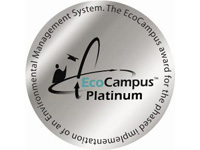 We also achieved Eco-Campus Platinum status in 2013, and at the time, were one of only 10 universities to do so. Click on the boxes below to find out more about how we are working to reduce our environmental impacts.